Nintendo has run a number of eShop retail download promotions in the past couple of years to encourage gamers to buy its products. Most of these have focused on the 3DS, with varying schemes in different territories offering free game downloads in return for registering a fixed number of retail titles or hardware itself; the Wii U has had some software related promotions, too. While great credit is due for the excellent promotions to date, it still feels like an area that can be explored further by the big N.
A new "recommended games" promotion in Japan represents one of the most interesting efforts to date, as it is a dynamic idea with changing benefits each month. 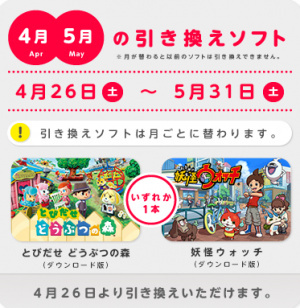 Those that buy a 3DS XL (known as LL in Japan) between 26th April and 30th September will receive a voucher that can be redeemed on a 3DS retail download. Yet there will be five monthly changes in which downloads you can choose, so from 26th April to 30th May gamers will have the choice of Animal Crossing: New Leaf or Yo-kai Watch, both hugely popular in the country. These will then be unavailable after that date with two different games then making up the options in June; so the titles will change each month until the promotion closes at the end of September. The key point is that those that receive a voucher with their hardware in that first window do not have to download either New Leaf or Yo-kai Watch, but can wait to see what titles arrive in subsequent months. As long as games are chosen during their eligible period there's no restriction in that respect, though vouchers do have to be used by 30th September, so those that hang on too long will be stuck with one of the final two choices. It's a clever scheme, as it can potentially prompt and encourage gamers to take the plunge on the hardware over the course of multiple months, with the offerings likely to tempt most at some point. With download codes only costing Nintendo the value of a lost sale — no distribution costs like with physical retail — this seems like an easy way to promote hardware sales in not only bundling a free game, but applying a degree of choice to the consumer. We'd love to see this in the West, naturally, while a similar scheme for the Wii U seems like a potential winner. Let us know what you think of this in the comments below. It would be nice if this happened in US too with longer time frames like this because I really do need a new 3DS because of my 5% of battery life after its been fully charged. A free game would be a nice bonus. When bundles started switching to digital downloads I wondered why they had to be fixed games and could not be a wildcard. It seems that this is a step in that direction. cant you just replace the battery? @Ninhau @Starwolf_UK Yeah it's time for me to upgrade anyways because of this small screen. Didn't know the battery prices was that low tho. @XFsWorld The circlepad on the 2DS is amazing. (At least the demo unit I tried on Friday.) Obviously the 2DS has other issues but I suspect there will be a new hardware revision before too long. If a 3DS XL revision comes out with that circle pad I am definitely changing mine. @XFsWorld - "because I really do need a new 3DS because of my 5% of battery life"
Getting to be time for me to start thinking about my July birthday present. 3DS XL is currently top of the list, free game wouldn't hurt. Good thing about a July birthday, E3 is in June. If Wii U has a poor showing new game wise its time for a 3DS XL. And all the $25 and $40 GC recently on 3DS XL makes me think a price drop could be coming. Sales are slowing and it's new game selection is waning w/ SSB being the big game this year obviously. And 3DS XL will be 2 years old in July and has NEVER had a price drop, so it's due. Not overdue, just due. And I'm still waiting for a revision. Rumors of a larger model of the Nintendo 3DS being in production appeared during June 2012, when Japanese publication Nikkei wrote an article stating that the system was initially scheduled to be unveiled at E3 2012. However, Nintendo responded that these rumors were false and that the article was "entire speculation", but refrained from further commenting on the subject. Finally, on June 21, 2012, the system was announced during a Nintendo Direct presentation, and was set to launch on all major regions during the middle of the year. This is nice and all, but why do they keep doing these things for the 3DS and not the Wii U, the system who needs promotions like this, as opposed to a system that already sells like hotcakes anyway? I don't understand. Sometimes it just seems to me like they WANT the Wii U to fail.